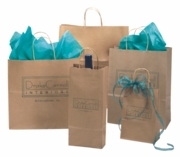 Paper and plastic bags and all of your packaging needs! Riven Distributors was established in 1980 and we are commited to our customers satisfaction. With over 36 years of experience, our company specializes but is not limited to the distribution of paper and plastic products. Our printing department has a wide variety of options for you to advertise your company. Please do not hesitate to contact us if you do not see what you are looking for on our website.